Do your part. PREVENT A LITTER! Promoting responsible dog guardianship through spay/neuter assistance and education in the Salem/Keizer, Oregon area. PAL was the dream of a passionate animal advocate, rescuer and volunteer. Seeing first hand the negative affects of pet overpopulation, Debbie wanted to be part of the solution. It was on that belief that PAL was started and so our mission began to provide spay/neuter assistance and education in an effort to help reduce pet overpopulation, the number of homeless and euthanized dogs and promote responsible pet guardianship in our community. Located in Salem, Oregon PAL is a 501(c)3 non-profit organization that raises money to help spay and neuter dogs in our community. 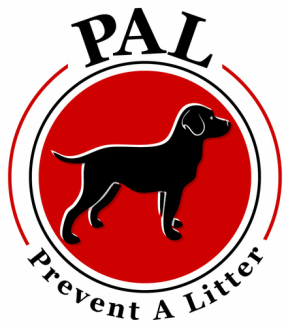 PAL was founded to help all breeds of dogs and all individuals in our community, with no income restrictions. In addition to providing spay and neuter assistance, PAL also promotes responsible pet guardianship through outreach and education. We collect fabric donation all year long for our annual fabric fair. Contact Debbie at 503-409-2543 to donate! Effective October 1, 2018, we are no longer working with VCA Iris Animal Hospital (formerly WVAH) in Keizer, OR for spay/neuter assistance. We are still working with Willamette Valley Animal Hospital in Tualatin, OR. We are in the process of making other arrangements so that we are able to continue providing spay/neuter assistance to individuals in the Salem/Keizer area. If you are interested in utilizing our services and are willing to travel to Tualatin, we are still providing services. All new requests for those seeking assistance in the Salem/Keizer area will be on hold until those arrangements are made. Thank you for your patience! *What qualifies as government assistance? Click here. DO NOT MAKE AN APPOINTMENT UNTIL YOU RECEIVE APPROVAL FROM US. WE WILL E-MAIL YOU WITH DIRECTIONS AND A CONFIRMATION, AFTER RECEIVING YOUR CO-PAY. WE DO NOT ACCEPT CO-PAY'S THROUGH PAYPAL. IF YOU WOULD LIKE TO MAKE AN ADDITIONAL DONATION, YOU ARE WELCOME TO DO THAT THROUGH PAYPAL. Please allow up to 7 business days for a response, as this is run by volunteers. Licensing is a requirement of using our services. If you are a Marion County resident, proof of licensing must be provided prior to services, OR be purchased at time of service (cost is $17/yr for a spayed or neutered dog). Dogs under 6 months of age are eligible for a free puppy license in Marion County. If you are not a Marion County resident, you must provide proof of licensing within 30 days of spay/neuter. *We are NOT a veterinary office, nor do we assist with medical services other than spay or neuter. We DO NOT provide assistance to cats. Please click on our resources tab for information about spay/neuter assistance for cats, pit bull specific resources in Oregon, and resources for other states.